HOW about running more than 43 marathons in 1 year? That's what Southport resident Andy Brown will be doing from the 18 November to fundraise for Muscular Dystrophy UK. Andy is no stranger to running a large distance having already taken part in the London Marathon earlier this year where he raised more than ₤3000 for Muscular Dystrophy. But now he has set his sights on a challenge that, in his own words:- "feels a lot more uncertain, if not a little scary." Andy will run a minimum of 5 km's every day for a whole year with a fundraising target of ₤3000. He is taking on this challenge to raise funds for registered charity Muscular Dystrophy UK after meeting 7 year old, Churchtown, youngster Bertie Kay, who has a very rare muscle wasting condition and was inspired to do something to help fund research into his condition for which there is no cure. Andy said:- "The anniversary of Bertie's official diagnosis is on 18 November 2018 and hearing how this day felt to Bertie and his family I felt this was a very appropriate day to start my challenge. I have now realised that means I will need to run at least 1134 miles which is the equivalent of over 43 marathons! It sounds quite daunting when I think of it like that but I am determined to do this to help raise funds for research into Bertie's condition." In 2014 (aged 2), Bertie was diagnosed with a progressive muscle-wasting condition attacking Bertie's strength and mobility, but also his ability to breathe too. Bertie's faulty collagen VI gene means that Bertie's body doesn't make this specific type of collagen very well. This is needed for making up connective tissue for muscle cells; like the scaffolding around each muscle cell. Because the structure of Bertie's muscle cells are weak, this means his muscle tissue doesn't repair or regenerate very effectively, meaning his muscles become weaker and weaker over time. 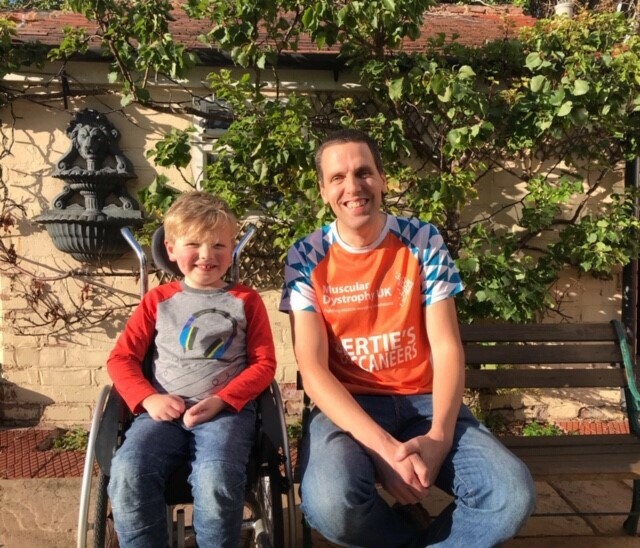 Charles Horton, Regional Development Manager for Muscular Dystrophy UK says:- "We are really grateful to Andy for taking on such a tough challenge in the coming year to help children like Bertie affected by Ullrich muscular dystrophy. Every day counts for these children and it is only through the support of our volunteer fundraisers that we are able to continue our work and fund the vital research that will hopefully, 1 day soon, bring about therapeutic treatments or ultimately, a cure. I look forward to watching Andy's progress over the coming year and wish him every success with his challenge." Andy Brown begins his year-long running challenge on 18 November 2018, and you can support him with a donation on his Just Giving Page. Any diagnosis of cancer is life changing, but what's particularly horrific about pancreatic cancer is its survival rate. Less than 7% of those who are diagnosed with the disease will survive past 5 years and most will die within 2 months to 6 months. This is the worst survival rate of any of the 22 common cancers and compares with 98%, 86%, and 67% survival for testicular, breast and cervical cancers respectively. 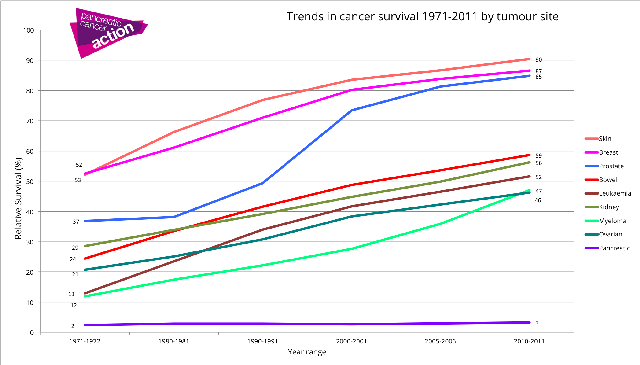 The survival statistics for pancreatic cancer have not changed markedly in nearly 50 years. The UK is also lagging far behind the rest of the world in terms of pancreatic cancer survival. This year a study found that the UK comes 47 out of the 56 countries surveyed for 5 year survival rates for pancreatic cancer, moreover, by 2025 deaths from pancreatic cancer are predicted to be 25% higher than breast cancer in the EU. Pancreatic cancer is almost always diagnosed too late for any effective treatment to be given, only 10% of patients are diagnosed in time for surgery (currently the only cure). In fact, ½ of those diagnosed with the disease find out about it in A&E. 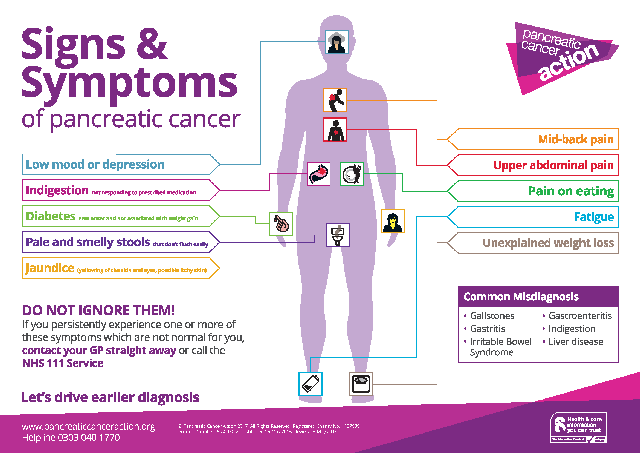 Knowing the signs and symptoms of pancreatic cancer is key for early diagnosis and improving survival rates. Founded by a pancreatic cancer survivor, who proves early diagnosis is achievable and survival is possible, Pancreatic Cancer Action (PCA) is on a mission to increase survival rates of pancreatic cancer by ensuring more people are diagnosed early and in time for surgery. Pancreatic Cancer Awareness Month aims to raise awareness of the signs and symptoms of the disease which is key to early diagnosis. PCA's Turn it Purple campaign is fantastic opportunity for friends, families and communities to come together and turn the UK purple to highlight the importance of pancreatic cancer awareness. This November, people all over the UK will be lighting buildings purple, holding:- 'wear it purple' and 'bake it purple' days and even planting purple pansies. If you want to take action against pancreatic cancer you can order your free 'Turn it Purple' pack on the Pancreatic Cancer Action website. Pancreatic Cancer Action is a UK based charity whose mission is to improve the survival rate of pancreatic cancer through early diagnosis. The charity's approach is to raise awareness of pancreatic cancer to the public, the medical community and Government, provide education and training on pancreatic cancer to medical professionals and fund research specifically into improving early diagnosis of pancreatic cancer. Pancreatic Cancer Action was founded by Ali Stunt, who is a rare survivor of the disease who wanted to change the low survival rate.